Today is April Fools Day, a day when things are often not what they seem. Our Nice Price or Crack Pipe AMC looks old and tired, but assuredly isn’t. We’ll have to see whether or not this ratted wagon comes with a price that’s the ultimate joke. Yesterday’s 1997 Lexus SC300 is basically a Supra under the skin, right down to the six beneath its hood and the five speed stick between the seats. That Lexus’s clothes however seemed a little less enjoyably flamboyant than its chassis-supplying Toyota sibling. That factor, and a nine grand price tag, outweighed the rarity of a manual gear box in a Lexus, and eventually dunned the car with a 65% Crack Pipe loss. Hey, do you remember this ad by BMW? Yes, it was a whole lot of harmless malarkey offered as an April Fools Day joke. It also served as evidence that the Germans have a sense of humor, which in fact they don’t. 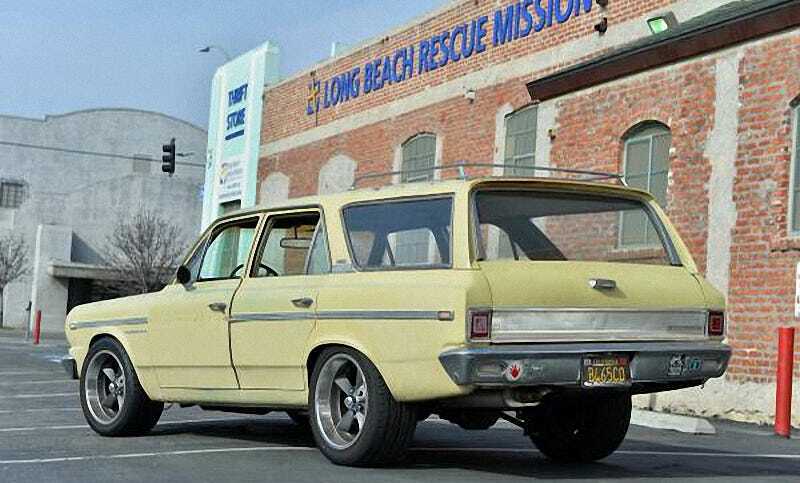 Regardless, we all enjoy a good laugh and so, seeing as today is the one day of the year when it’s fun not to know what’s what, let’s have a look at this questionable 1969 AMC Rambler wagon. First impression? That looks like something that someone both drives… and possibly lives in. There’s a healthy patina showing through the buttercup paint, and the teal interior needs, well, some attention. Once you get past the fact that this car is yellow and teal however, you’ll start to notice other aspects of its presentation. First off there’s those fat meats wrapped around a tasty set of MB Old Schools. Those certainly dress things up, as does the jaunty angle at which the car sits owing to a dropped front end. That front end is made possible by viewers like you and a coil over double wishbone front suspension that also rocks a power rack and Wilwood six piston brakes. Yeah, things are definitely not what they seem. The backend is equally beefy, sporting a narrowed Ford 8.8-inch axle and LSD pumpkin on a custom four-link set up. Between all that is custom pan work, a bespoke front subframe, and full car wiring harness to light up your life. Why all the fancy pants suspension and performance-oriented pieces? Well, under the Rambler’s hood lives a Chevy LS1 of uncertain origins. Behind that is a BW/Tremec T56 six speed, operated via a shift lever fashioned out of a box-end wrench. I’m guessing inch and a quarter. That’s some pretty serious iron. You can read through all the parts that are claimed to have got into this build, it’s all there in the ad. Alternatively, you could skip that and focus on the claimed thirty grand investment that all those various parts and their installation have cost. There’s evidently yet more to be done. The ad notes the need of some sort of HVAC plan and interior work, but honestly the car lives in LA, where heaters and A/C aren’t mandatory inclusions, and that ratty interior totally befits the ratted exterior. Whatever the car’s next steps will be, they will have to take place without the present owner’s involvement. He notes in the ad that this project is his “pride and joy” but doesn’t clue us in on what is the impetus for the sale. Of course he’s not letting it go for cheap, asking $22,500 for it as is. That’s a lot for an unfinished project, but if you consider the work, the time, and the parts that have gone into this cool ride, you’ll probably have a hard time choosing what button below to press. Of course in the end you’ll have to choose one—deal or no deal—and even through this is April Fools Day we don’t want you fooling around with your opinion. What do you think, does this amazing sleeper rat rod of a Rambler seem to be worth its $22,500 asking? Or, would you have to be a fool to pay that much? Los Angeles Craigslist, or go here if the ad disappears. H/T to DOldsammyb and Rutherford for the hookup!